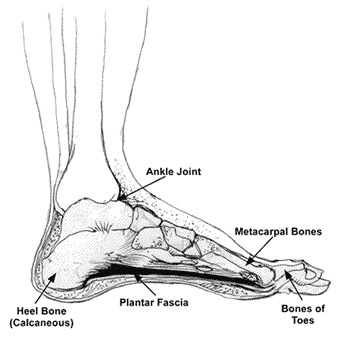 The plantar fascia is a thick fibrous band of tissue under the foot which runs from the heel to the toes. Plantar fasciitis is an inflammation of this band and usually causes pain in the arch of the foot, near the heel. Pain in the arch of the foot, usually nearer the heel. Pain is often worse first thing in the morning and usually improves through the day. Pain may be worse at the start of a run. Stretching of the plantar fascia may reproduce pain. Tightness of the calf muscles placing more stress on the plantar fascia. Incorrect or over worn shoes. Weakness of the muscles underneath the foot and of the calf muscles. Avoidance of activities which aggravate the symptoms. Using ice wrapped in a damp cloth for 10 — 15 mins regularly. Non-steroidal anti-inflammatory drugs (eg. Ibuprofen). Consult your pharmacist / General Practitioner for advise / dosage. Taping of the foot — a Chartered Physiotherapist can advise on this. Stand with the toes of your affected foot on the edge of a step. Lower your heel and transfer your weight to that foot until you feel a stretch under the arch of your foot. Hold for 30 secs as tolerated. Stand with one foot in front of the other and hands against a wall. Make sure that both feet are pointing forwards and that both heels remain on the floor. Lean in to the wall until you feel a stretch down the back of your calf. Hold for 30 seconds. Massage therapy to the foot arch and calf. You can self-massage using a golf ball which is placed under your foot. Roll it repeatedly from your toes to your heel. A heel raise may be worn in you shoe initially. Ensure correct running shoes — use gait analysis if necessary. Once pain has decreased start a strengthening programme to include heel raises from a step and picking up objects with your toes.